Today’s dish is Homemade Achari Paneer Masala. A spicy piquant curry with Cottage cheese, made with Indian pickling spices, to be eaten with steaming hot Ghee Rotis right off the tawa or white fluffy rice. One of my earliest memories of school are from when I was probably 6 years old, sitting on the steps with my girl friends, swapping homemade Mango pickles and parathas made by our mothers. Have you ever had homemade Mango pickles? It’s usually made with raw small green mangoes-quartered and preserved in a milieu of Mustard oil,Fennel Seeds(saunf),Nigella Seeds(Kalonji),Mustard Seeds(Rai) & Fenugreek Seeds(Methi seeds).When I made this curry the first time I was aiming to harness that taste of my childhood.Though i know nothing can compare to the pickles made by my late grandmother I still had to try!She could make pickles out of anything! Really..We counted..there was no vegetable or fruit in site which couldn’t be pickled according to her. This recipe has been in the testing phase for a long time because I wanted to get it just right.No room for error or cutting corners in this one. I have taken what I have learnt by eating (mostly eating) and observing ,when my grandmother and mother made pickles , and used it in making this nostalgic Homemade Achari Paneer Masala.Though I usually do not cook in mustard oil,I have used it in this recipe, because the taste and aroma from mustard oil , is the first thing that hits you when you eat an Indian Mango pickle. The hero spice in this dish is the saunf and kalongi- the Fennel seeds and the Nigella seeds, without which any pickle really would not be a pickle.Therefore, play around with the recipe if you must but do not skip the pickling spices because without them it will just be Paneer Masala. Give this Homemade Achari Paneer Masala a try sometime, it’s really not as complex as it looks.I promise! Also before you go, do take a look at my other no fuss, quick paneer recipes too –My Mom’s Quick Paneer Capsicum,light and breezy Cottage Cheese and Tomato Salad . Who doesn’t like cotton soft paneer in their curry?but most store bought paneer is quite hard.The best way to make them soft and fresh is by soaking them in warm water with a little splash(1 tsp) of vinegar for 10-15 minutes before using. Soak the Cashews in hot water for about 15-20 minutes. Dry Roast the ingredients listed under masala on low flame for about 5-10 minutes till the spices release their aroma.Let them cool and grind to a powder. Puree the green capsicum, cashews and tomatoes together and set aside. Heat the mustard oil to its smoking point.Add the Green Chillies and Asafoetida.Saute for 10-15 seconds. Add in the chopped Onions and cook till they turn slightly golden brown. Once the onions are brown, add the powdered masalas and roast toghether for about 15 -20 seconds.Keep a close eye. Spoon in the pureed tomato and capsicum and cook till the gravy thickens and the oil separates and starts flowing on the sides. Add the paneer and cook for just 2 minutes till the paneer comes up to the temperature of the gravy. If not serving immediately,Store the masala gravy in the fridge.Heat the gravy and Add the paneer just before serving. 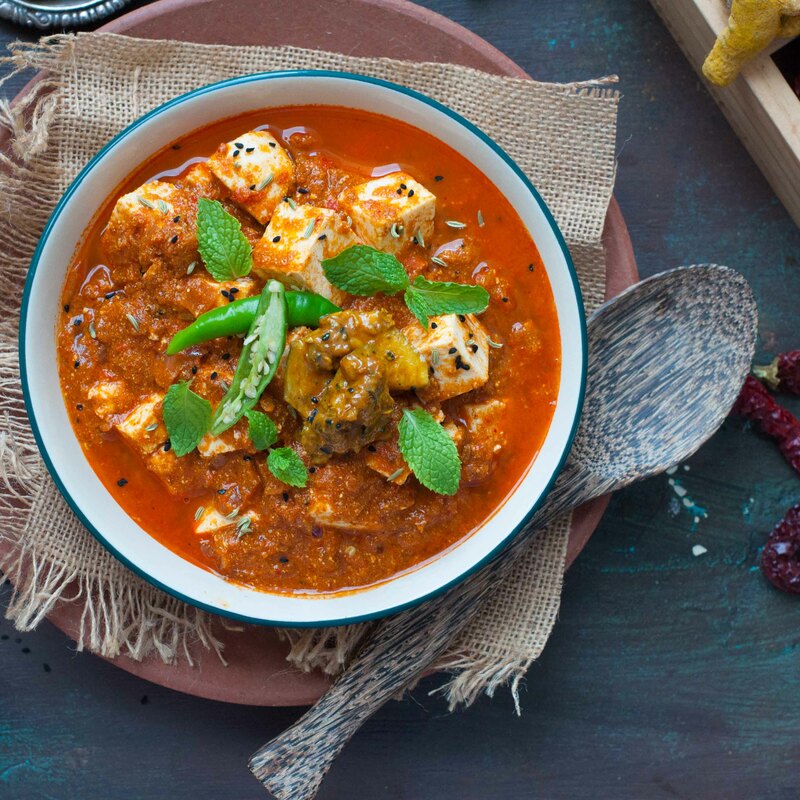 If you are on a lactose free diet or simply can’t stand paneer, pair the same Achari Masala with boiled potatoes or a mix of vegetables or koftas. Another great option is using tofu instead. At times , when I have some not so appetising vegetables lying around in the dark depths of the fridge ,I fish out my Achari masalas and simply stir fry the thinly sliced veggies with some mustard oil in it.This trick especially works well with veggies like tindley and apple guards, which are only bought in the house when I feel guilty of eating too much capsicum and bhindi! Other Indian Curries that you will most certainly love! I tried out the Achari paneer recipe today- turned out pretty delicious, highly recommend trying out this recipe. P.S. The paneer softening tip was just amazing – made the otherwise hard paneer melt in the mouth !! Thankyou Sneha for this review..I am so glad you loved it.